The temperature at the garden this morning was -2 F. Luckily the snow cover has kept the frost from creeping into the hoop houses. They will get to a balmy 60 F + today and by noon the spinach, frozen last night, can be picked by noon. 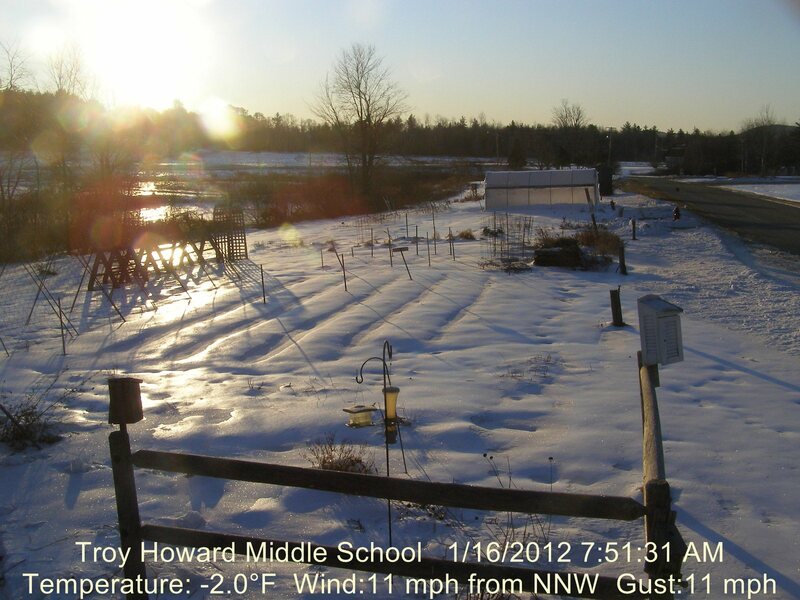 The heated greenhouse is 48 F but will rise to the mid 80 s on this clear sunny day. This is what we have to go through to eat local greens in the state of Maine. Following is a picture of the garden from the web cam on this fine morning. « I got the privilege of taking pictures of Troy Howard Middle School’s Green House and blog about them. The Green House is very important to Troy Howard because it helps us get food to munch on while we are eating in our own cafeteria. Hope you enjoy the pictures!